This Phoksumdo Lake Trek is truly off the beaten track. This homestay trek in Dolpa is a unique and once in a lifetime experience. You get the opportunity to be the guest of locals as you’ll be taken into their home. 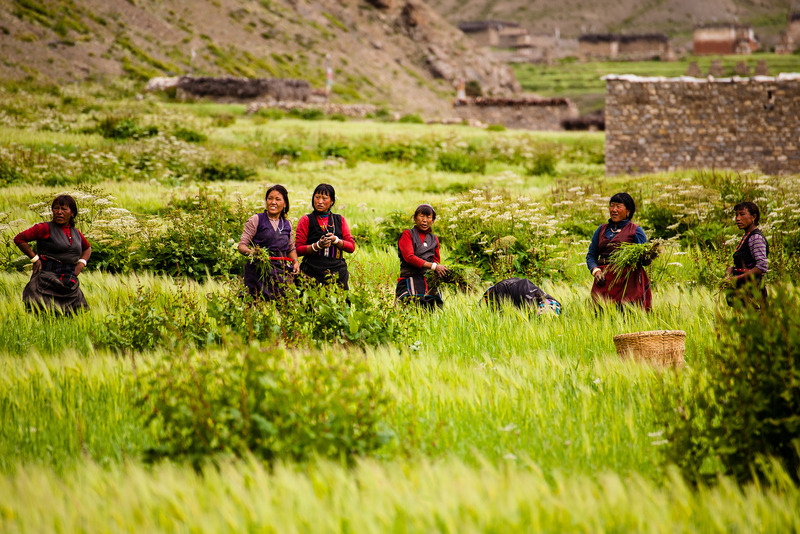 And this is a complete other world, as these locals mostly don’t know much about the world outside Dolpa. 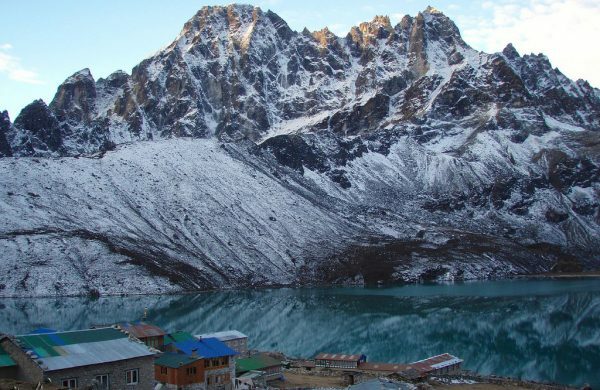 All about the Phoksumdo Lake Trek [Homestay]. 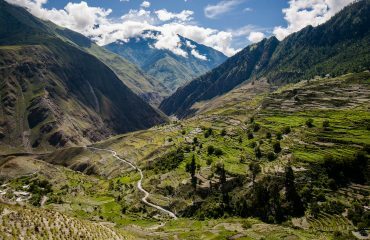 Dolpa is a remote and spectacular corner of the Himalaya, and is isolated from the rest of Nepal by high passes in the south. 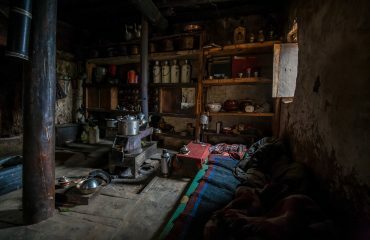 This homestay trek in untouched Dolpa is truly a unique experience. You get the opportunity to be the guest to locals as you’ll be taken into their home. As a result we also join meals together on the floor of their kitchen. 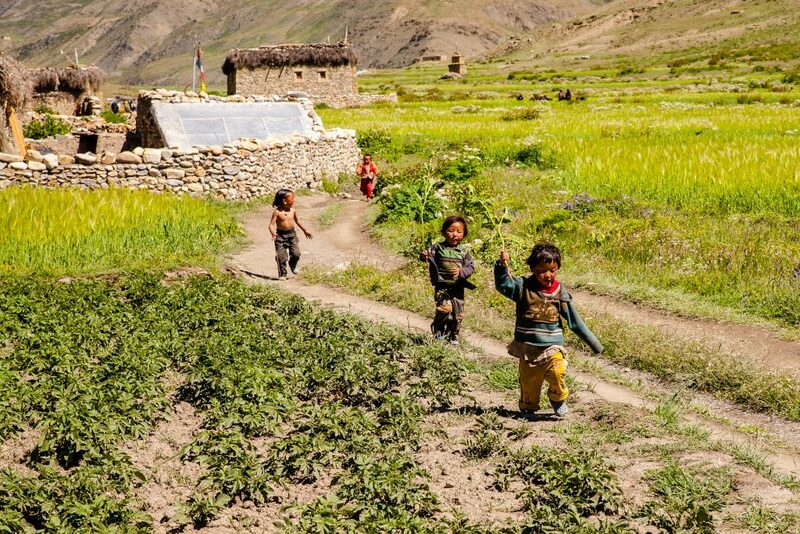 And when we explore the villages and surrounding fields, we probably are accompanied by curious children. The two highlights of this trek are our time in the village of Majhphal and in Ringmo by Phoksumdo Lake. In Majhphal, you can feel what life is like in Dolpa as we’re the guests in the home of locals. In this village, the Tibetan-style houses are closely packed together. Furthermore, the houses are often stacked atop another up the hill and share common roofs. 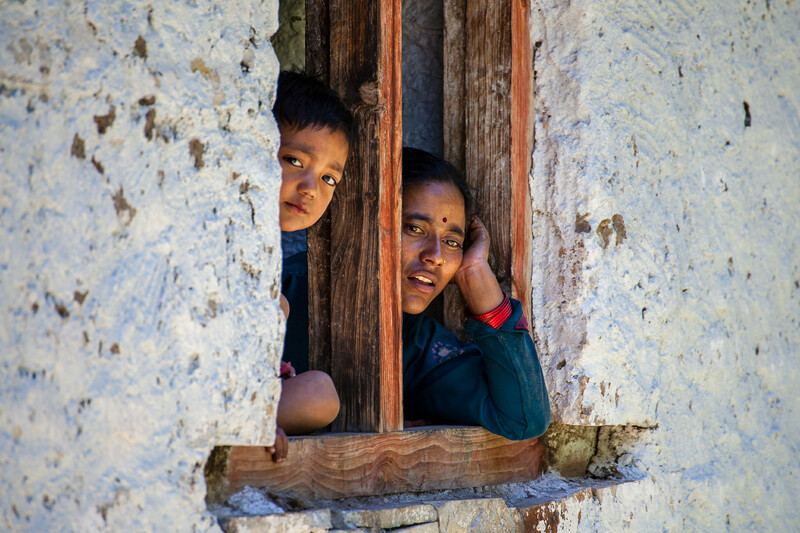 People, even little children, climb from one level to another via the carved log ladders outside the houses. 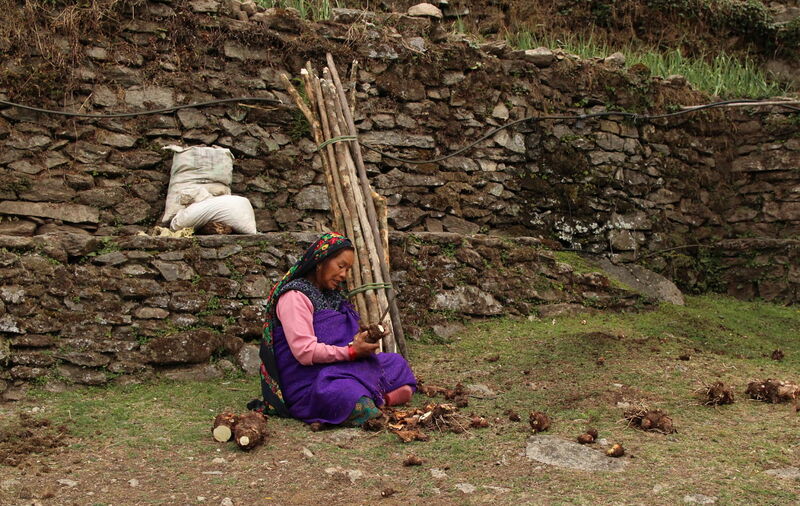 These villagers mostly live off their land and cattle. To reach Phoksumdo Lake we follow the Suli Khola river from Dunai, all the way up to Ringmo. This is a village that’s located on a 30,000 to 40,000 year-old landslide dam. As a result, this dam formed the lake on the north side. And on the southern side of the dam, the water of the lake plunges down a 167 meter tall waterfall. 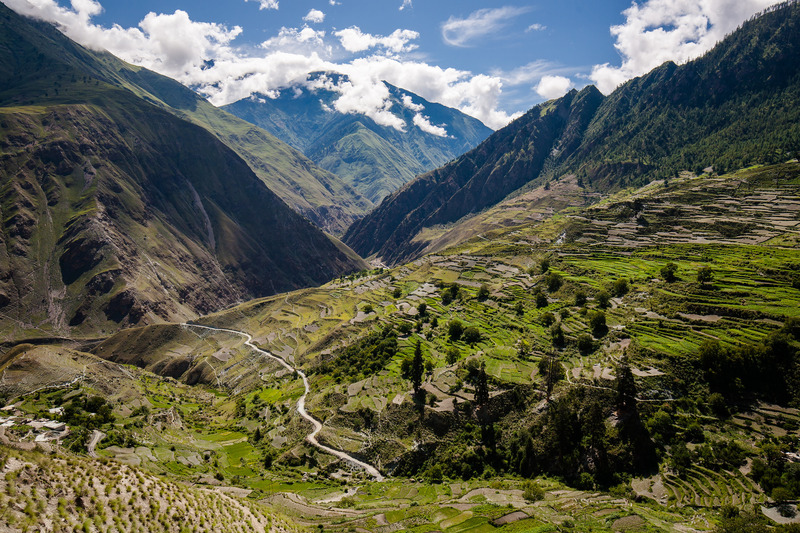 Are you getting excited about trekking in Dolpa? And are you fit enough to spice it up a little more? 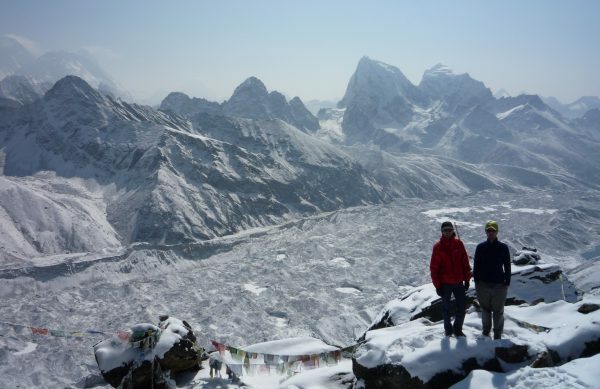 Then take a look at the massive 17-days Untouched Dolpo Trek via two high passes. With this trek, you trek to Phoksumdo Lake and further. To the beautiful valley of Dho Tarap. This is a remote valley of pure Tibetan influence. It consists of several clusters of closely packed stone houses. Scattered across the valley you find numerous Buddhist monasteries and chortens. From Juphal we walk to the very local village of Majhphal. Here we’ll spend the night and the next day. The village of Majhphal is a place where it seems like time stood still, for a very very long time. 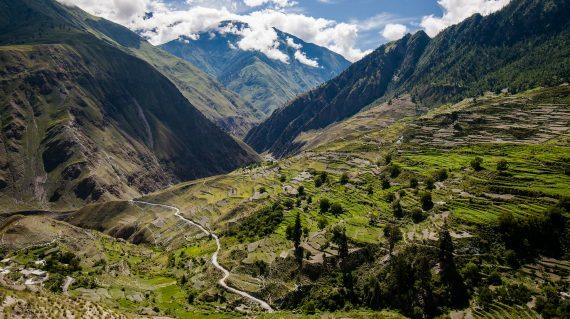 In this farmers village, you get to see what remote life is like. Imagine how these villagers live with the rhythm of nature and daylight as they have electricity only since 2016. Today, it is time to go. Partly, you leave the village via the trail you arrived two days earlier. You trek over a ridge, descend on the other side and follow the river to Dunai (2145m). We have early breakfast and start our trek by crossing the river Bheri via a suspension bridge. On the other side of the river, we continue our trek towards Suligad. Then we reach the office of Shey Phoksumdo National Park where we show our permits and let us registered. The upriver trail is mostly through shrubs and on the precipice mostly exposed to the morning sun. 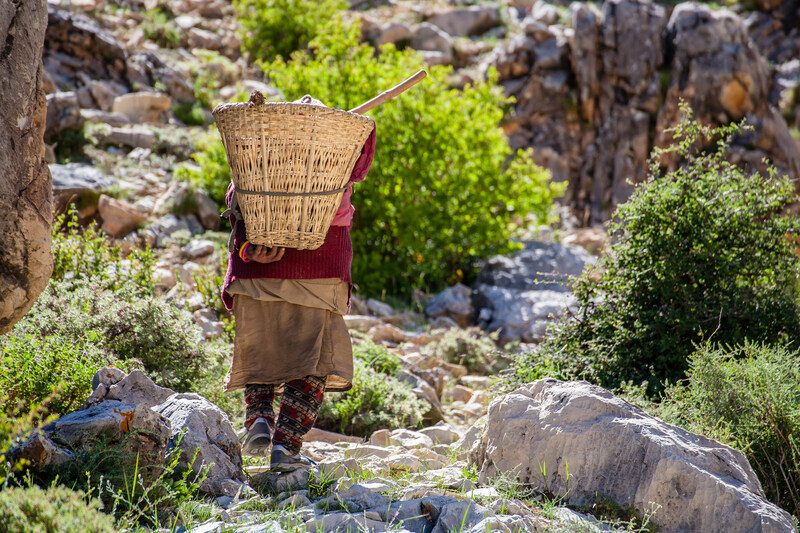 At Kageni we cross a wooden bridge and continue uphill, about 150 feet above Suli. The narrow trail leads us to a wide riverside winter sheds of B’onpos from Ringmo called Jalash. Then there’s a gradual uphill walk on the precipice and through a shade of maple, oak and pine till there’s a quick but mild descend to a wooden bridge. The last 1,5 hour to Chhepka is a strenuous bit of an uphill trek. Today is a real test for endurance. There are 3 major uphills and downhills at places where the gullies run deep and narrow. The trail narrows and is often found squandered by larger beasts of burdens at certain places. The first 2 hours from Chhepka is a comfortable hike through the giant pines, oaks, maple, walnut, and birch. The trail is wider and mostly along the river bank. In the morning, the damp dark soil often captures footprints of larger mammals, primates, and horned herbivores. At Rechi, there is a lone abandoned bungalow and a campsite. From here, the trail widens miraculously to reach Boarding. Here, se set up our camp in a green pasture overlooking the high peaks. 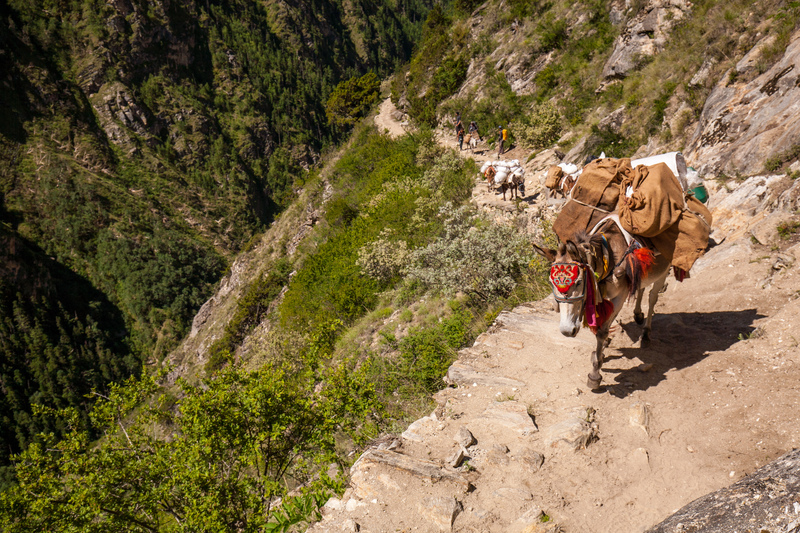 Today is the shortest yet most exhilarating day of the entire trek. 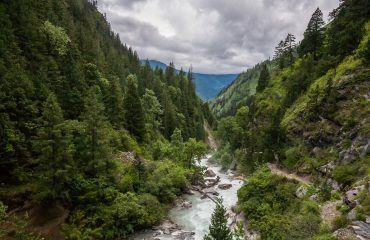 The altitude crosses 3000 meters and the trail on the precipice is narrow and steep with confusing runoffs of loose soil and inhospitable rocks. The vegetation changes dramatically with the presence of sparse juniper shrubs and a few cypresses. The steep climb definitely burns calories but reaching the waterfall viewpoint is rewarding. The 260 degrees view of the beautiful terraced farms of Reike, Sunduwa and the nearby mountains are quite breathtaking. 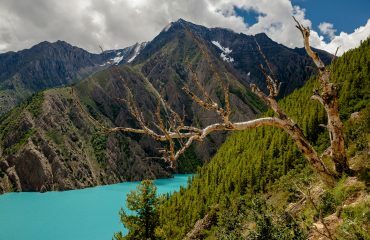 About 30 meters above this point, the trail ends the climb and also graces the first sneak peek of the turquoise Shey Phoksumdo Lake. From here to the campsite at lakeside, only takes about 25 minutes of an easy downhill walk through pine groves, chortens, and the village of Ringmo. 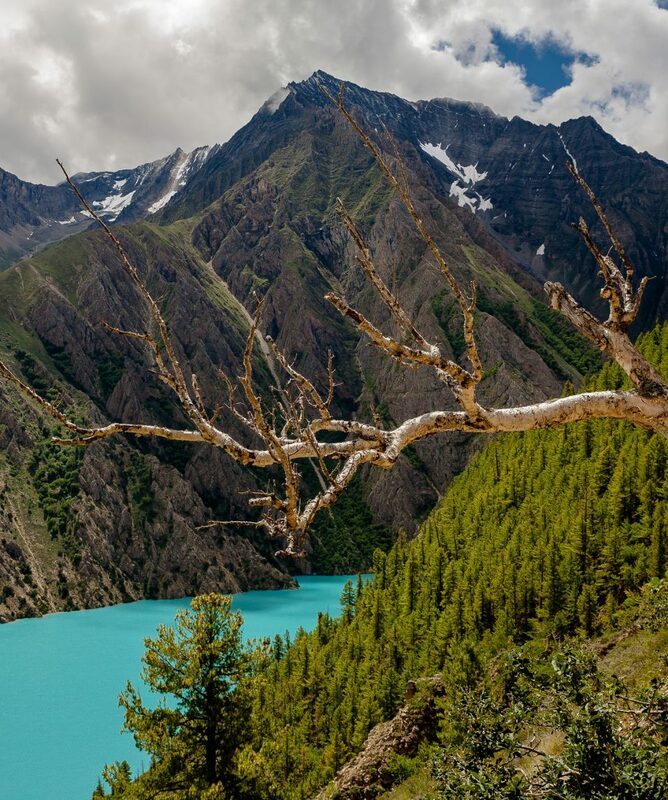 The village of Ringmo lies on the bank of Shey Phoksumdo Lake. 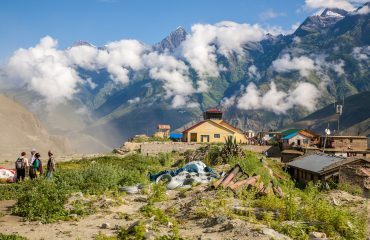 About 20 Tibetan style houses are clustered in a close knit to form the village, surrounded by scattered cairns and chortens. The people of Ringmo are B’onpos, the followers of the B’on tradition. 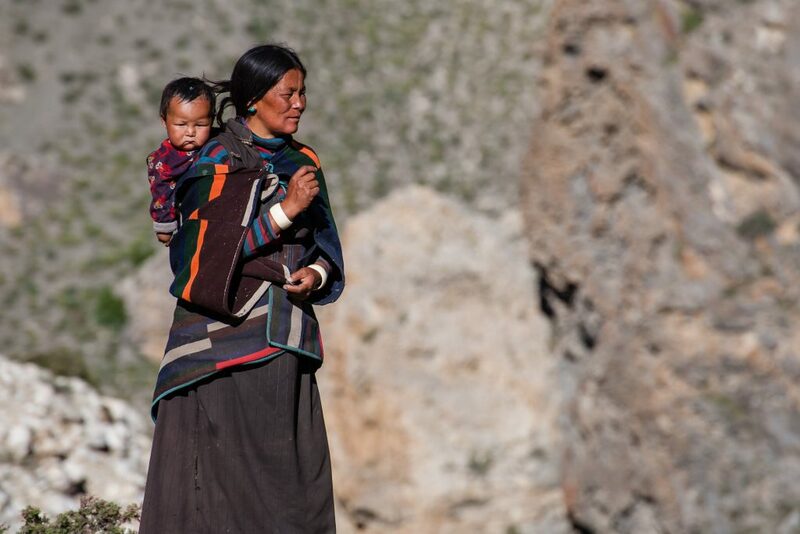 They are subsistence farmers and also raise yaks, dzos, and some horses. B’onpos are strict adherents of nonviolence and hence refrain from any form of animal sacrifices. 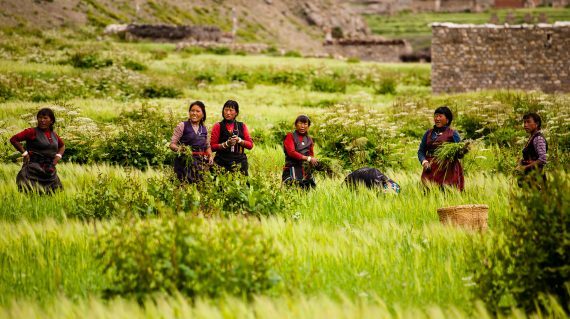 During the harvesting season, women and children work in the fields while the men cross the high mountain passes to reach the border of China to trade. It is quite a relief to not see a single person clad in jeans and modern appliances. And means of communications are close to non-existence. The lifestyle is still traditional and simple. In Ringmo there is an old B’on monastery. The chortens at the entrance of the monastery are fascinating for it has large horns of either blue sheep or Himalayan thar. There is also a small museum at the monastery. The Lama will kindly guide you through the monastery and briefly speak about B’on. The trek downhill from Ringmo to Sunduwa is quite steep. Along the way, you may spot a lone lammergier on the top of the ridge. Today is the last day of our trek. We start off early after breakfast. There are no major uphills or torturous downhill except anymore, except for the last 1,5 hour to reach Juphal uphill. Today, the distance that we cover is quite a conquest. Early morning, we catch the flight back to Nepalganj and go back to the hotel. Here, you can finally take a good shower, and relax. 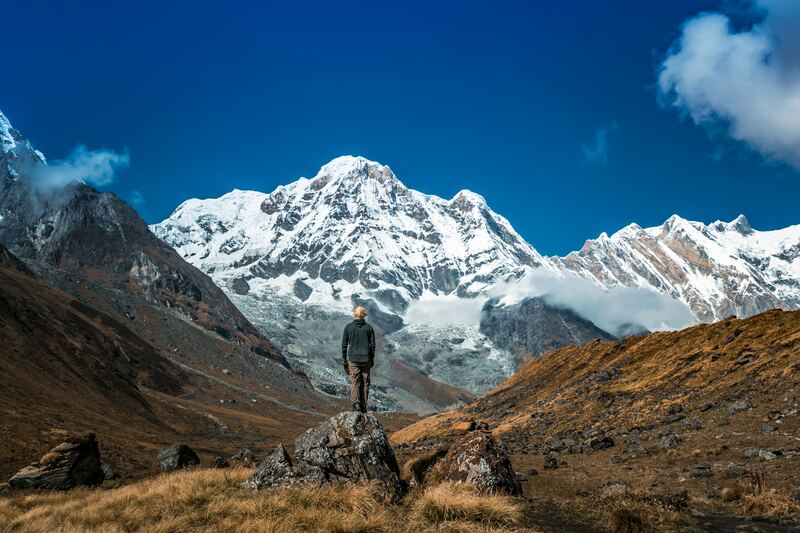 "Life is a great big Canvas"
In Kathmandu and Nepalganj, before and after your Shey Phoksumdo Lake trek, you will be staying at a 3-star hotel with a private bathroom and wifi. The hotel in Kathmandu has a prime location, in the travellers neighbourhood Thamel. This are nearby many restaurants, trekking gear shops and supermarkets. The hotel in Nepalganj is very close to the domestic airport. 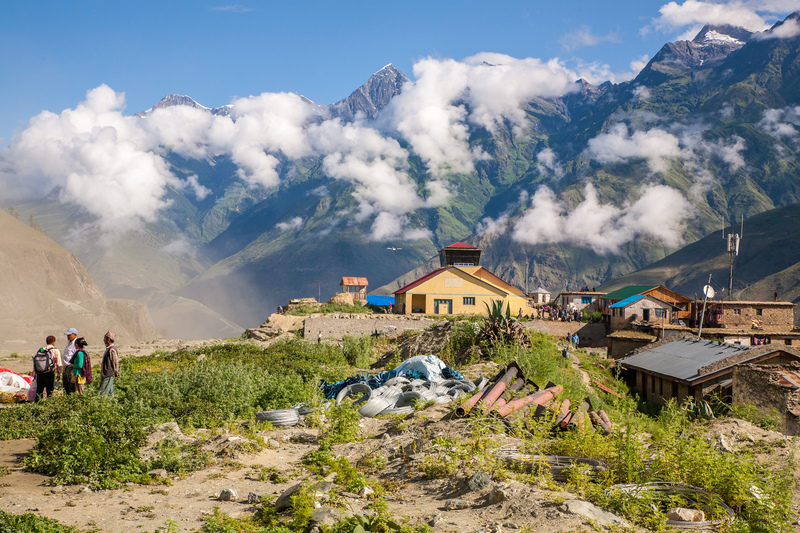 This is needed as your flight to Dolpa will be early morning.